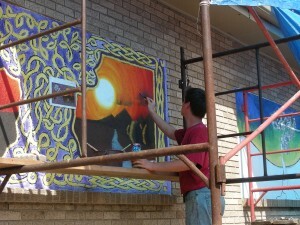 Josh Dillman works on his mural in the BMH/Tree of Live Plaza during the Fall of 2012. A recent graduate of Grace College who was one of the artists involved with creating murals on the BMH Plaza in Winona Lake, Ind., has died in an automobile accident in Newton County, Ind. Daniel J. (Josh) Dillman, of Brazil, Ind., died Friday afternoon (May 17) in a crash involving a semitrailer on U.S. 41. For more information, see this story from nwi.com. Josh graduated May 11 from Grace College with a Bachelor of Science Degree in Graphic Design and Illustration. He was one of 16 students in the Art Integration class taught by Cindy Bryan who worked in the Fall of 2012 to produce murals on the south exterior wall of the BMH/Tree of Life building. One of the murals, The Union of Life, was his concept and he spent many long hours working on the painting. On Sunday, May 19, his father share about Josh’s life and death in a message to Christ Community Church in Brazil, Ind. Listen to the sermon, titled “Stewardship, Grace, and Love,” here. Visitation will be at Christ Community Church, 10942 Indiana 59, Brazil, Ind. 47834 on Thursday, May 23 from 4-8 p.m. and Friday, May 24 from 1:30-3:30 p.m. A celebration service will be held Friday at 3:30 p.m. at the church. The family requests that in lieu of flowers, gifts be addressed to the Children/Youth Ministry of Christ Community Church. The obituary for Daniel Joshua Dillman appears here.